The world today is in a mess. Look at your neighborhood and look at the world. 2.5 billion people survive on less than $2 a day. More than $800 billion are spent on the military every year. The private assets of the 200 richest people in the world are more than the combined incomes of the poorest 2.4 billion. But is humanity really condemned to live under this violent and irrational system forever? We don’t think so. An alternative does exist and is worth fighting for. History has not ended — it has barely even begun. The main factor pushing our society toward revolution is the irrationality of the capitalist system. Look at the huge gap in this society between the tremendous potential for providing for human needs and the existing reality. Take the question of hunger. According to the government, 1 out of 10 people — and about 1 out of 6 children — in the U.S. are currently going hungry. Things are even worse worldwide, with 854 million people going hungry, 2 million more than last year. Every day, about 30,000 children die from hunger-related causes — one child every three seconds. So is there just “not enough to go around”? If you had a say in running society, you’d probably argue: “Let’s just give the extra food to the people who need it.” It’s common sense, right? But capitalism is not based on common sense — it’s based on making profits. It’s a system where the means of production (the factories, the land, the mines, etc.) are not owned or controlled by society as a whole. Instead, they are owned by a tiny fraction of the population: the capitalists. Goods are not produced to satisfy human needs, they are produced to make profits for those on top. Because there is no profit to be made in providing food to poor people, millions are just left to starve. It is an upside-down system. President Obama bails out the Wall St. bankers responsible for the current financial mess and billions are spent on prisons and war, while our public schools and hospitals crumble. Few science-fiction writers of the past could have imagined a more warped society. Capitalism wasn’t always reactionary. Capitalism in its ascendant stage, from the 16th century to the early 20th century, was overall a progressive factor for humanity — despite the exploitation and racism that it generated. This new system smashed feudal backwardness, revolutionized technology and the productive forces, and industrialized many countries in Europe. The basic economic contradictions of the system — such as the phenomenon that too many goods are produced for workers of a given country to buy back (overproduction) — could be overcome as long as capitalism was expanding geographically, spreading like a virus throughout the world, selling its surplus goods to colonies throughout Asia, Latin America, and Africa. But the earth is only so big. By 1914 there were no new major markets to conquer and the major capitalist countries — England, France, the United States, and Germany — were obliged to fight each other for control over the existing markets and colonies. World War I, one of bloodiest and most barbaric chapters in human history, showed that capitalism had entered its final stage: senile imperialism, in which profits are made principally through destruction, not production. Flash forward to today. Can anybody deny that the crisis begun in 1914 has only gotten worse? Isn’t the current “financial meltdown” really the crisis of the capitalist system itself? This offensive is threatening the very existence of whole nations. Here are a few examples. Through war, U.S. imperialism has destroyed the infrastructure, productive capabilities, and public services of Iraq, Afghanistan, and Yugoslavia. Through privatization, deregulation, and the “foreign debt,” imperialism has decimated dozens of countries in Africa, Asia, and Eastern Europe. Look at the chaos and devastation imposed on the African continent — 3,000 people die every day from AIDS, only 1% of AIDS patients are treated, only 1 in 3 children complete school, and half the population lives on less than one dollar per day. This is the future that the capitalist system has in store for every country of world — unless it is overthrown. Are we exaggerating? Not at all. Look at New Orleans and you’ll see that this devastation has already reached the shores of the United States. Here’s the bottom line: We have the technology and resources to provide decent lives for all of humanity, yet more people are currently starving and sick than ever before in human history. Let’s look at the facts. To stay competitive in the market, all corporations (regardless of how humanitarian their owners might be) are forced to maximize profits by lowering wages, cutting benefits, evading environmental controls and other regulations, and moving their businesses to countries where it is easier to do so. The U.N.’s Jean Ziegler observed that all corporations “must be predators, otherwise they will get devoured by the competition.” Just as cancer cannot be cured with a band-aid, this “race toward the bottom” cannot be ended by any governmental reform or by asking the capitalists to abide by humanitarian “codes of conduct” — which are primarily publicity ploys and means to co-opt and integrate opposition, while business continues as usual. “Fair trade” capitalism — or a “solidarity economy” based on co-operatives — will never replace down-and-dirty capitalism for the following reason: Companies that don’t focus on profit-making inevitably fall behind the competition and are obliged to either merge with a profitable company or go out of business. Experience shows that it is impossible to create islands of socialism in a sea of capitalism. In this context, it should come as no surprise that the main proponents of “humanizing capitalism” — non-profits (NGOs) and the Social Forums — are funded primarily by the institutions of imperialism, such as the Ford Foundation and the World Bank. What if we elect a progressive government to power? Unfortunately, real power today lies in institutions that are free of the influence of the popular vote. The people do not elect the heads of the military, the police chiefs, the administrators of the top government departments, or the judges. We do not elect the leaders of the institutions which, more and more, dictate economic and social policies to governments throughout the world: the World Bank, the IMF, etc. So when the people elect an administration that refuses to play by the rules of the ruling class, the capitalists are forced to discard their democratic façade and use their economic influence and the unelected institutions of the state (primarily the military) to destabilize and overthrow the elected bodies. One glaring example of this phenomenon took place in 1973, when a self-proclaimed socialist, Salvador Allende, was elected president of Chile. When Allende began to nationalize the copper industry (which was owned by U.S. corporations) and when he took steps toward providing land for the landless, a wing of the Chilean ruling class banded together with the military and the CIA, staged a coup, killed Allende, assassinated thousands of workers and peasants, and brought the dictator Augusto Pinochet to power. More recently, similar attacks have taken place against the democratically elected governments in Venezuela and Bolivia. Wage earners — called the “gravediggers of capitalism” by Karl Marx for their capacity to overturn the system that relies on them — make up well over 75% of the population in the United States. Workers survive by selling their labor to the capitalists, in exchange for a wage. Calling for the exploited to find “common cause” with their exploiters is not only utopian, it’s also reactionary in practice because it means pushing for workers to dissolve the only instruments they have to defend their specific interests — their class organizations, particularly their labor unions. The economy and all of society would grind to a screeching halt without the labor of working people. Workers — black, white, and immigrant; men and women; blue-collar and white-collar — can shut down any city in a matter of minutes just by folding their arms. We run the schools, the fields, the stores, the factories, the offices, transportation; we are the soldiers in the military; and we produce and distribute food, gas, light, heat — everything. That’s real power. Even the White House itself is dependent on its janitors, secretaries, cooks, and clerks. As the famous union song “Solidarity Forever” explains, “Without our brain and muscle not a single wheel would turn!” Recently, in December 2005, more than 20,000 transit workers struck in New York City and effectively shut down much of the city. And that was only a glimpse of our potential power. If you look at any major institution in our country — the government, the schools, the corporations, the army — you’ll see that they are all structured pretty much the same way: a pyramid from the top going down. At the very top of these institutions you almost always have the most influential capitalists, the members of the ruling class. “Never before in the history of humanity has so much power been concentrated into the hands of so few people,” concludes Jean Ziegler. During the year 2007, the wealth of the richest 0.13% people in the world rose by 8.2% — meaning that this tiny minority now controls 25% of the world’s wealth! One of the most dangerous and prevalent illusions hammered into our heads is racism. Racism — like sexism and homophobia — pits workers against each other to keep them from uniting against their real enemy: the bosses. White workers are turned against Blacks. Native-born workers are told immigrants are “stealing their jobs.” It’s an age-old strategy of divide and conquer. It’s also an effective way to super-exploit entire segments of the working class — resulting, for example, in Black people having double the poverty rates of whites. In the United States — a country built on the ideology of white supremacy and the subjugation of Black people and other oppressed nationalities — the fight against racism and all forms of oppression is at the core of the fight for social justice. Are the Democrats a “Lesser Evil”? Elections under our two-party system are a game of “heads we lose, tails they win” because big business funds and controls both the Republicans and the Democrats. The two parties have differences, but (behind the rhetoric) these are disputes over how to best defend the interests of the ruling rich. They debate how many troops should occupy Iraq and how many miles of wall should be built on the border to keep out “illegals.” The idea that the U.S. has no right to be in Iraq or that no human being is illegal never even enters the debate. A central obstacle on the road to social change in the United States is the subordination of the leaderships of the labor, anti-war, Black, and immigrant rights’ movements to the Democratic Party, which uses populist rhetoric to co-opt, disorient, and demobilize the biggest threats to corporate rule — independent mass struggles. Ever since the invasion of Iraq in March 2003 and the huge anti-war protests of millions, key forces such as United For Peace and Justice, Moveon.org and many union bureaucrats, have subordinated the anti-war movement to a focus on electing Democrats. The result? Every two years, activists of the peace movement are swept out of the streets to waste huge amounts of money and energy to elect politicians who talk about ending the war, but who loyally continue to support it. And now Obama is expanding the war in Afghanistan and he refuses to bring back all the troops from Iraq. The Democratic Party is a graveyard for social movements. The populist rebellion of the 1890s, the explosive labor struggles of the 1930s, and the civil rights and Black Power struggles of the 1960s and ’70s all fell apart when the Democrats successfully co-opted the leaderships of these movements. We in Socialist Organizer argue for a clean break with the twin parties of the bosses and we fight for the creation of a mass independent Labor Party based on the trade unions and all the organizations of the oppressed — a party of and for the working class majority. How Do Mass Movements Happen? In reality, the majority of workers in the United States have seen their living conditions steadily deteriorate since 1973. Working people struggle every day to make ends meet and live in constant fear that their family will be thrown into the streets if they lose their job or get sick. The fact is that the United States has the highest poverty and inequality rates of any industrialized nation and as high an infant mortality rate as Malaysia. And with the current economic crisis, all this is getting worse. But bad living conditions don’t automatically lead to struggle. If that were the case, then the whole continent of Africa would be in a permanent state of rebellion. In reality, a central obstacle toward collective resistance is the widespread illusion of powerlessness promoted by the bosses and their lackeys in the mass movements. All too often we activists are told, “I support your cause and I’d go to your protest, but it won’t make a difference anyhow!” This pervasive sense of powerlessness is why we cannot radicalize the American people by ourselves. Go buy a bull-horn, stand on a busy street-corner, shout about the need for revolution and see how many people you convince. Most people will reject the case for radical change as “utopian” until they experience the empowering force of collective resistance. That is why fightbacks around immediate demands — for example, against budget cuts or the ICE raids and deportations — are so important. These struggles rapidly transform ordinary people, give them a sense of their strength, and force them to start shedding their illusions. The new immigrants rights’ movement is a perfect example of this explosive process. Years went by with barely a peep from immigrants — so the whole world was taken by surprise when millions poured into the streets in the spring of 2006. Most participants entered the movement with little political clarity. Many thought that the Democrats were their allies — until they saw the Democrats refuse to call for an end to the ICE raids. Many thought the police existed to “fight crime and protect communities” — until they saw the L.A. cops brutally attack peaceful protestors on May 1, 2007. Similarly, both the strengths and weaknesses of the movement demonstrated in practice the need for more unity among workers of different nationalities. And most important, these experiences revealed to millions their collective power. The sleeping giant has begun to wake up. What is the Relationship Between Reform and Revolution? Today — under capitalism in its final stage of decay — any reform that could meaningfully raise the living standards of the majority inevitably reaches beyond the narrow limits of the system. Not one of the principal demands of the existing mass movements can be fully satisfied under capitalism. In this context, the fight to defend past reforms and win new ones is inextricably tied to the fight for to overthrow the system as a whole. Independent mass fightbacks — no matter how limited the initial demands — are the first step of revolution, the bridge toward higher levels of consciousness and organization, because ordinary people learn in the fire of struggle. Struggles of one sector of the oppressed also inspire other struggles. Confidence and hope are contagious. That’s why years, even decades, can go by with few major protests, but when a mass movement does arise, it hits society like a bolt of lightning — and tends to spread like wildfire throughout the working class and throughout the country. This has happened time and time again in this country’s history. Look at how the Civil Rights movement of the early 1960s fueled the Black Power and antiwar movements — which in turn fueled and fed off of the explosive fightbacks of women, Chicanos, gays, and rank-and-file workers from 1968 to 1973. What Does a Revolution Look Like? Revolutions are the climax and result of the whole preceding period of sharpening social crisis and deepening mass mobilizations. In this sense, revolutions are like earthquakes — which occur at the inescapable moment when years of friction built up between colliding landmasses reaches a breaking point and must be released. When society’s crisis reaches its boiling point, millions of ordinary people with no previous experience in politics explode onto the political stage, in search of a solution to their most urgent needs. This — not a conspiracy of armed radicals — is what we mean when we talk about revolution. During periods of revolutionary crisis, general strikes — labor strikes of all the workers of a city or even the whole country — can definitively demonstrate the earth-shaking power of the working class to run society on its own. For example, during the San Francisco general strike of 1934, communal dining halls run by the strike committee fed the whole city. This unprecedented wave of resistance requires a new type of organization to channel the struggle — workers’ councils. These mass institutions of grassroots democracy — where all representatives are directly elected and instantly recallable by their peers in the workplaces — are instruments of struggle and, potentially, organs of a new power. During the great upheavals of the last century these organizations arose under different names — most famously, they were called soviets (Russia 1905 and 1917), factory councils (Italy 1920), workers’ councils (Germany 1918, Hungary 1956), Asamblea Popular (Bolivia 1971 and 2005), cordones industriales (Chile 1973), and shoras (Iran 1979). The emergence of workers’ councils opens a stormy situation of dual power — where the capitalist state exists side by side with the councils, embryos of a new workers’ government. Obviously, this situation cannot last forever. Either the people will put all power into the hands of the councils or the old regime will wait out the crisis and then re-impose its rule. But won’t the government use the army and police to crush any revolution? The army is made up of the poor and in times of revolutionary crisis, rank-and-file mutinies within the armed forces are common. Would you shoot your friends and family members who are fighting for social change? By winning over the ranks of the army, workers and the oppressed can come to power peacefully. The monumental task of rebuilding society on a free and democratic basis would begin and a brilliant new chapter in human history would unfold. Is a Revolutionary Socialist Party Necessary? History shows that without the help of a sufficiently influential revolutionary socialist party, workers can rock capitalism back on its heels, but cannot knock it out. The masses storm onto the political stage with a definite sense that “things must change,” but without a clear perspective on how this change can be accomplished. This poses an obvious problem, because revolutionary situations cannot last for long — no more than a few days, weeks or months at most. There is little time for experimenting or learning by trial and error. If the workers fail to strike when the iron is hot, demoralization will seep in and the counter-revolution will take the initiative. This is why a revolutionary socialist party — which acts as the workers’ collective memory by passing on the lessons learned through past struggles — is needed. Trying to fight for revolution without the benefit of these lessons is like hiking at night without a map or a flashlight and hoping you will eventually make it to your destination. In the same way that steam needs a piston to be effectively channeled, the mass upsurges of the oppressed can only result in victory when a revolutionary party exists that can effectively provide a realistic plan toward taking power and can help the people overcome all the obstacles in their path. As we mentioned earlier, the most important obstacles are the bought-off “left-wing” leaders and organizations that promote class-collaboration. These representatives of the bosses within our movement are the folks who today dissolve our struggles and independent organizations into the Democratic Party and who tomorrow, during a revolutionary crisis, will preach “moderation” and try to put a brake on the upsurge by pushing for “alliances” with our exploiters. We socialists don’t deny that many people today are greedy or selfish. That doesn’t mean, however, that these are inborn traits. They are the by-products of an inequitable distribution of wealth and are reinforced by the capitalist-controlled media and educational system. Capitalism wasn’t created by “natural greed”: capitalism makes greed seem natural. The idea that people are naturally greedy is similar to the idea, popular during feudalism, that “some are born to rule, and some are born to be ruled.” Every ruling class wants people to think its rule is eternal and natural. But capitalism is far from eternal. For most of human history, there were no classes, and we lived communally in small bands, dividing up the work and the wealth in the interest of everyone. Indeed, various classless societies — such as the !Kung people in Namibia and Botswana — still exist today. “Human nature” isn’t different in these cultures — the structure of society is. Under capitalism, humanity is like a plant trying to flower in a dark cellar— we don’t get much of a chance to develop our potential. But, if we were raised in the soil of a different society, isn’t it obvious that we would change? In a socialist society where there is an abundance of goods, what would be the point in hoarding or stealing? Socialism does not mean “making everybody the same.” It does not mean totalitarianism. It does not mean “the end of freedom.” These are myths. Socialism means the expansion of democracy in all aspects of society. But society can only reach this stage by ending economic scarcity. In economically backward countries like Russia, China or Cuba, the economic preconditions for building a socialist society simply did not exist. Socialism cannot be built within the borders of one country — especially not a poor, peasant country. Why then did V.I Lenin, Leon Trotsky and the Bolshevik Party lead the Russian workers to power in October 1917? The answer is simple. They saw themselves as “the advanced outpost of the world revolution” and sought to spread the revolution internationally. In fact, a massive revolutionary wave did sweep over Europe and the world after 1917, but the workers’ revolutions in Germany, Italy, and Hungary were crushed and drowned in blood, due to the absence of revolutionary parties able to lead the struggle to victory. By 1921, starvation, poverty, and unemployment ravaged Russia — due to an imperialist-funded civil war, the armed invasion of 14 countries, and a full economic blockade. The tremendous scarcity of essentials like food and clothing led some government functionaries to begin to siphon off goods for themselves. In order to secure its privileged position, this emerging bureaucracy, led by Joseph Stalin, had to eliminate all organs of democracy in the party and the government. Stalin’s first victims were those socialists of the “Left Opposition” led by Leon Trotsky, who fought (as had V.I. Lenin in the last months of his life) to return the revolution to its democratic roots and the newly formed Third International to its internationalist program. The Fourth International grew out of this heroic struggle. Here’s the point: If you understand the socio-economic roots of Stalinism, then you can see why what happened in Russia wouldn’t necessarily happen in the United States, the richest, most technologically advanced country in the world. 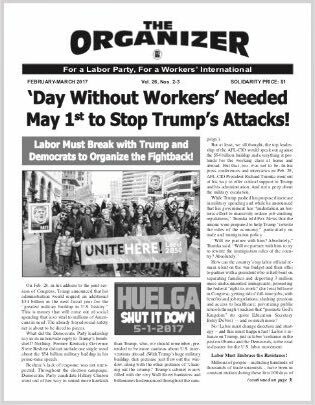 What Is Socialist Organizer and What Are We Fighting For? 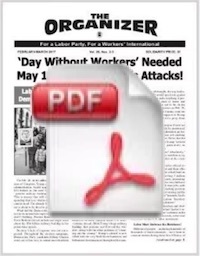 Socialist Organizer is the U.S. section of the Fourth International, an international organization of workers and youth in 45 countries that stands in the revolutionary socialist traditions of Karl Marx, V.I. Lenin, and Leon Trotsky. We participate in all struggles for progressive social change, mobilize for the unity and independence of working people, the oppressed, and their organizations, and always try to point the way forward in the struggle. We fight for socialism, for the expropriation of the major means of production. We fight for a society where the people, organized into grassroots multi-party councils, would decide all major economic, political, and cultural questions. Democratic rights such as freedom of speech, freedom of the press, freedom of assembly, and freedom of association would become realities for all. Production would finally be put toward providing for human needs. Vast resources would be allocated to provide for everybody’s basic human needs, to eradicate illnesses such as AIDS, and to take measures to save the environment by constructing mass public transportation and harnessing reusable energy sources, to mention just two proposals. The real history of humanity would begin. The fate of humanity is at stake. 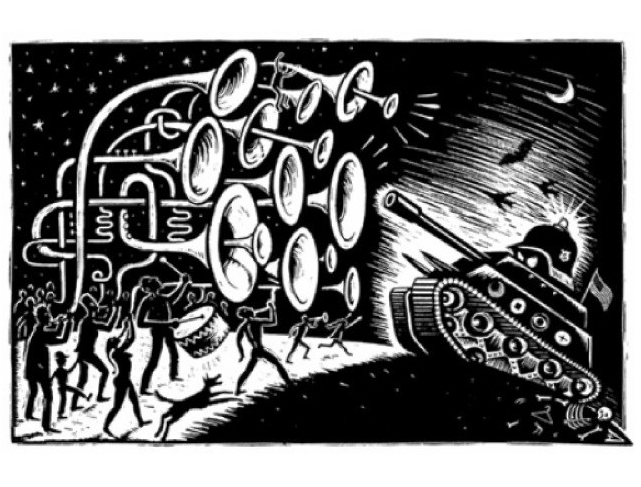 In the 21st century, revolutionary situations are going to arise at home and abroad because capitalism is a self-destructing system that can only create more misery, more hunger, and more war. But will the upcoming revolutions meet the same tragic fate as most of those in the 20th century? Will society go forward to socialism or backwards to chaos and collapse? The answer largely depends on if we can build the revolutionary organization we need in time. It depends on people like you.